The inaugural Cleveland Central Promise Neighborhood Preschool Read and Ride program awarded 14 preschool students with brand new bicycles. As part of the Read and Ride program, Promise Neighborhood preschool families read 866 books and 116 families participated in the program. “It was awesome to see the growth of Frederick and Diamond during the program,” said Maria Schulenberg, preschool teacher at Marion-Sterling Elementary of the school’s Read and Ride winners. Cleveland Central Promise Neighborhood envisions that every child is ready for kindergarten and that every third grader reads at third grade level. The preschool Read and Ride program is a fun, family-oriented activity that supports families in reinforcing reading at home. Pratt used a number of community resources to get books for her and Deon’tae to read. She went to the library, received books from Help Me Grow and took advantage of the books provided by the Read and Ride program. Cleveland Central Promise Neighborhood hosted the Read and Ride program for early learning centers through a partnership with Starting Point and Kids Book Bank. The contest was held at seven Step Up to Quality rated early childcare learning centers located in the Central neighborhood. Families with children enrolled in these programs were eligible to win a bicycle if they read at least three books with their child. For each additional book read, the child’s name was placed in the drawing for the bicycle. 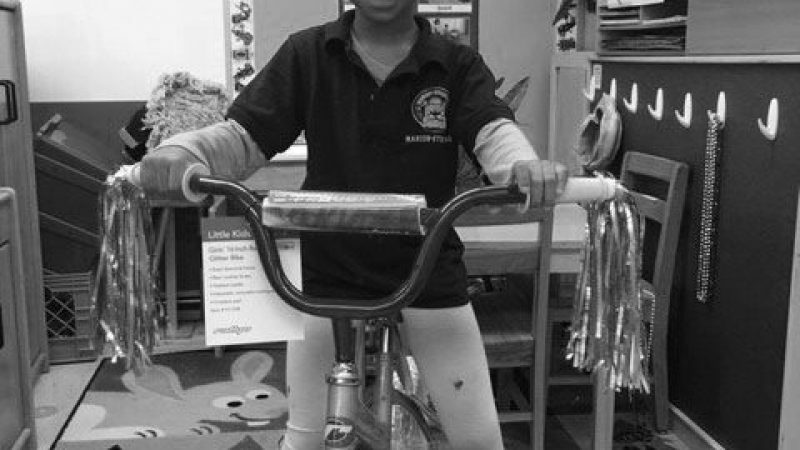 The Read and Ride program began at George Washington Carver Elementary in 2015 and is now held at all Cleveland Metropolitan School District elementary schools in the Promise Neighborhood. Read and Ride has been successful in motivating first and second grade students to expand their reading, so in 2017, Cleveland Central Promise Neighborhood staff decided to expand the program to early learners. Early learning and child care centers prepare children to transition to kindergarten. According to research, children who attend high-quality preschool enter kindergarten with better pre-reading skills, richer vocabularies, and stronger basic math skills than those who do not. Programs like Read and Ride can help improve a child’s vocabulary and increase their confidence. Children who read better tend to do better across all school subjects. Bicycles were provided by Cleveland Central Promise Neighborhood and books were provided by Kid’s Book Bank of Cleveland.